I kind of feel bad for saying this considering I was on vacation through Wednesday, but TGIF! It’s always so hard to get back into the groove after a trip like that, so it’s nice that my work week has been super short. You all know of my love for neutral toppers, this one being a longtime favorite from Club Monaco (similar on sale here). 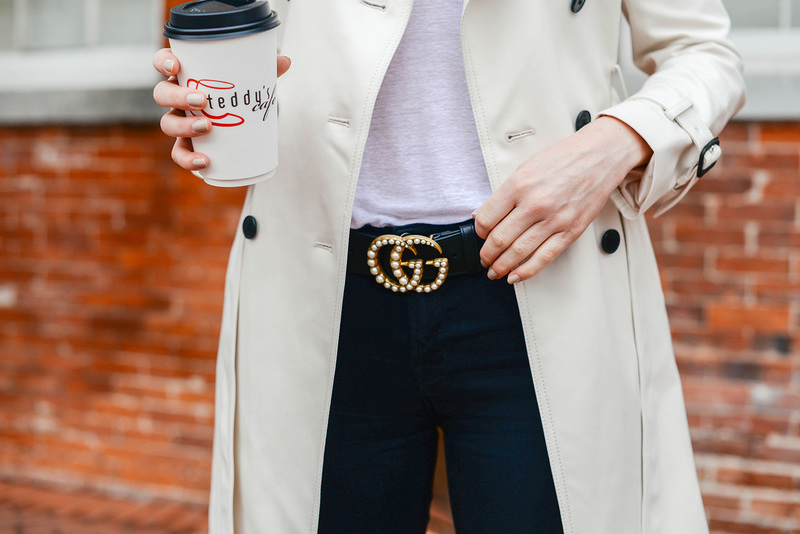 Before my New Orleans trip, I stopped into Club Monaco to see if they had any cute new arrivals I could take with me and happened on this polished belted trench. I love how the subtle puffed sleeves give this wardrobe staple a slightly feminine twist! That detail, combined with such a classic palette and tailored silhouette make it a winner in my book. I paired it with black skinnies, an easy v-neck tee, my new Gucci belt and comfortable flats for a sophisticated daytime outfit on my trip. It was ideal for exploring the World War II museum – it was super chilly in there! You may have also seen me re-wear the trench a few days later with this button-down and jeans again on the plane home. It’s just such an effortless, no-fuss ensemble that I’ll never get tired of. A piece that transitions easily from work to play to travel, every girl should have one of these! Looking for an Easter dress for next weekend? Try this pale pink scalloped number (THE SLEEVES!) or this lilac lace dress. Stocking up on stylish shorts is a necessity in Texas for summer. This pair is elevated and unique, but also incredibly versatile. I’m really into the midi dress these days, due to it’s flattering and comfortable daytime appeal. This floral-print dress is next on my list! So pretty. Throw this pom pom LWD over a bikini at the beach or with heeled espadrilles for dinner! I love the gathered sleeves on this seersucker top – perfect for wearing with white shorts, skirts and denim this season. If you’re on the hunt for a neutral light layer to throw on over your go-to dresses this summer, this lightweight moto jacket is a sure bet. Such a useful neutral! You have the best neutral outfits and this one is for sure one my favorites! Love these classic pieces on you, lady!